Do you want to know why Kinect is a really good deal at $150? Microsoft explains how with these handy charts. I don't know about anyone else, but Kinect feels a bit expensive at its finally confirmed price of $149.99, even with Kinect Adventures thrown in. According to charts released by Microsoft (obtained by Kotaku), I'm wrong and Kinect is a great deal when compared to other motion gaming alternatives. The chart shows how someone that currently owns zero consoles will only have to spend $300 to get the newly announced slim Xbox 360 4GB model that includes Kinect, and they're good to go. 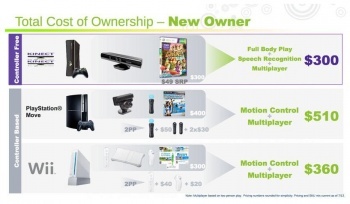 To get a similar two-player experience out of the Nintendo Wii, gamers will have to spend $360: $200 on a Wii, $100 on Wii Fit with the Balance Board, and $60 on a second Wii Remote and Nunchuck. Sony's PlayStation 3 + Move bundle is $400, with Microsoft adding a second Move controller at $50 and two Navigation controllers at $30 each for a total cost of $510. For those that already own each console, Microsoft points out that gamers will only have to spend $150 on the Kinect peripheral. A similar PlayStation Move bundle costs $100, with an additional Move controller and two Navigation controllers again putting consumers back an additional $110 for a total of $210. 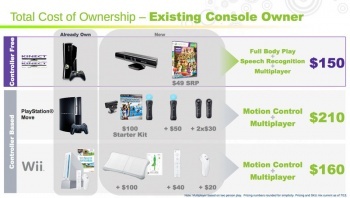 Adding Wii Fit, a second Wii Remote, and a second Nunchuck to a Wii will cost $160. I'm glad to know the reasoning behind Kinect's price point, but Microsoft isn't being totally fair. A PlayStation 3 Move bundle comes with a 120 GB PlayStation 3, while the Xbox 360 Kinect bundle comes with 4 GB hard drive which will simply not do for many Xbox 360 players. Move's Navigation controllers are not positively necessary, but a second PS3 controller will run $55 anyway so that point is somewhat moot. Is Wii Fit necessary to play the Wii? Not really, but it does sort of compare to what can be done with Kinect. I've got to admit, Microsoft has convinced me somewhat with its charts here, aside from the comparison of a 4 GB 360 slim to a 120 GB PlayStation 3. The company seems to have done its research on the matter. I'm just saying, if Kinect was priced at $99 it would have been more agreeable to most of us. Is this Microsoft spin or do these charts have a point?